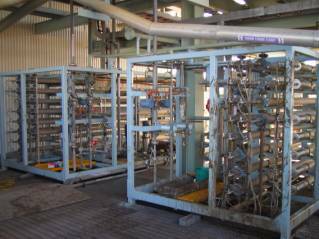 A project was developed from the conception phase through research and development, plant design, plant fabrication and plant commissioning. Reverse Osmosis technology was implemented to produce two valuable product streams from a cyanide waste stream. The feed stream was the vapour condensate from the cyanide evaporation process. The product streams developed were a concentrated cyanide stream returned to the production facility and a demineralised water stream used for cooling water make-up. The project had both economic and environmental advantages. This project involved the design and installation of an acidic cleaning system to remove foulant from the membranes of the reverse osmosis process. This project had a number of complexities with respect to safely using acidic material to clean cyanide systems and the associated risk of hydrogen cyanide production.